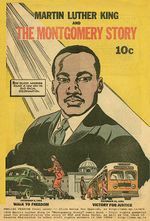 The Montgomery Story, Comic cover, 1956. The Montgomery Bus Boycott was initiated in December 1955 and cancelled in December 1956. The reason for the boycott, which among others involved Martin Luther King, was an Alabama law allowing bus companies to segregate black and white passengers. Finally, the United States Supreme Court decided that the segregation was violating the United States Constitution. This page was last modified on 15 February 2019, at 04:14.